When Michelle Simmons became Australian of the Year on Australia Day eve, I was reminded of an early ground-breaking Web project instigated by the University Librarian at the time of Michelle's appointment to the University of New South Wales. Marian Bate, UNSW University Librarian from 1995 until 2001, led the Australasian Digital Theses (ADT) project. She earned global recognition for its development and implementation. Marian was a wonderful mentor to many young library staff and passionate about the work of libraries to empower research. She also strongly believed in the value of collaboration and exemplified this by serving on the National Library's Advisory Committee to national union catalogue services for several years. These "Australian" qualities were echoed in Michelle's acceptance speech. Marian would have been absolutely thrilled to see her colleague receive this accolade. ADT was launched in 2000, the brainchild of Marian Bate. 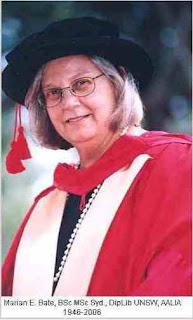 Always a staunch advocate for the raising the international profile of Australian academic research, in 1999 Marian identified the enhanced visibility of theses as an important strategy for improving scholarly communication, and to that end, sought funding from the Australian Research Council to develop a new service for capturing a global audience for Australian research. Marian’s strategy also emphasised the need for digital versions to be provided. Seven universities including her own grasped the opportunity to work with Marian. 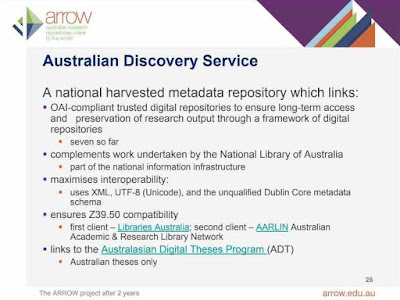 Using the open source Electronic Theses & Dissertations software developed at Virginia Tech in the US, many university libraries in Australia launched thesis repositories and using simple technologies, access to the content was brought together under the strong ADT brand. In later years, separate thesis services have been merged with institutional repositories. Michelle receives a mention in the newsletter too. ADT was the precursor to another initiative known as the ARROW Project. She may not have known it, but for me Michelle was a global use case scenario in the collaborative ARROW Project. The use case involved trying to co-locate the research outputs of academics who moved across institutions. The outputs could take the form of theses, conference papers, book chapters, and monographs and two decades later, more unconventional forms. How could the Project acknowledge the complete intellectual record of an individual researcher? The optimum pathway may still not be implemented but a combination of research visibility in Trove and its recognition of ORCIDs, have gone a long way to resolving that use case. Michelle's citizenship also helps, for which she deserves our thanks.